This week we had our big test — a practical exam and a written exam. On my written I got an 84 and on my practical I got a 71. I have to retake my practical because I need a 75 to pass. I knew the correct things but I let my nervousness mess me up. It doesn't bother me if I don't do as well in some things as in others, because it shows me what areas I should study more. I also like to share my experience on this blog because there might be people reading this who are in beauty school and having trouble with tests, and I want them know it's going to be fine. Messing up tests happens to everybody, and as long as you use it as a push to do better the next time around, you will. We had mostly free days this week and I did a mood-changing gel nail and a mood-changing acrylic nail. I love the mood effect acrylic! It's so cool and easy to work with. 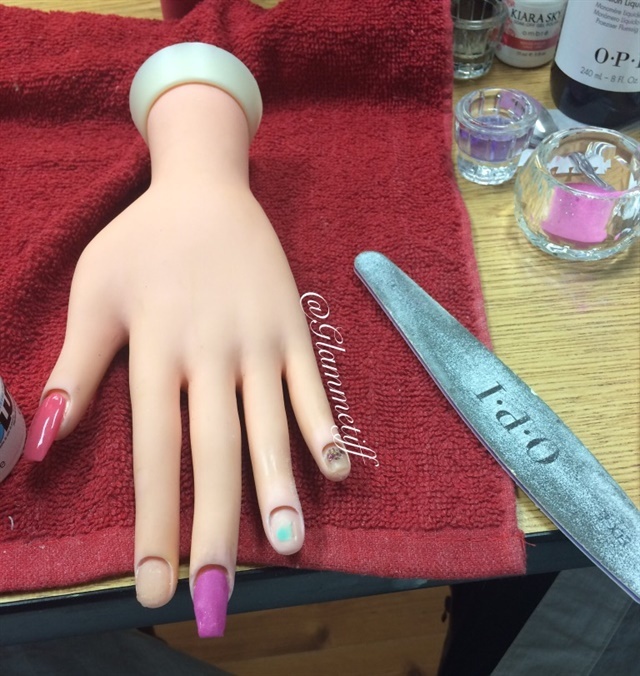 At the end of the week we practiced the manicure and pedicure steps, and I prepped my nails for next week when we do the manicure steps again. We had a time limit of 15 minutes to do a manicure, and I finished in 10. Then we had 30 minutes to do a pedicure, and I finished in 15. It's funny because I used to move really slowly, but I'm learning to work faster, which is definitely needed for the State Board Exam. We start learning about the chemistry side of nail technology next week, and it should be fun. I just want to say thank you to everyone who reads my blog each week; it really means a lot to me and hopefully it can help anybody who is in beauty school or thinking about going to beauty school. Thank you again, and have wonderful week. See you in Week 8!